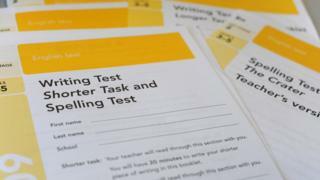 A school has had its SATs exam results annulled, after an investigation by an education watchdog. It follows an investigation by the Standards and Testing Agency (STA) into exams sat by Year Six pupils at Redby Academy in Sunderland last summer. The results no longer count, but pupils will not be "negatively impacted upon" as they are now at secondary school. The academy said it was carrying out an investigation into what may have gone wrong and could not comment further. The Department for Education said in a statement: "Following an investigation, Key Stage 2 results for grammar, punctuation, spelling and mathematics have been annulled for all pupils. "This will not, however, adversely affect any of the pupils personally as the school can provide statutory teacher assessment data to show their progress and attainment in English and mathematics." Wearmouth Learning Trust, which manages Redby, said the academy had "complied with all requirements of the STA". It added: "All pupils affected have successfully transitioned to secondary school and this will have no negative impact on them." Reasons the agency may annul test results range from the early opening of test papers to pupils receiving too much help from teachers during exams. However, the STA has not given any further information about its investigation into Redby Academy.